I forgot to put my ice scraper in the car on the first frosty night and it wasn't a thin ice I could just blast off with the defrost on high. Since no one else was in the parking lot I pulled out my grocery shopping card and started scraping away, it took a little longer than normal but it worked well. However, I had to get a new card the next time I was at the grocery store. ☼ Placed thick plastic over the window - An old shower curtain would do the trick as well and you can slam it in the door on a windy night ... Read the entire article. This website is sponsored by The Herbs Place, distributor of Nature's Sunshine herbs, supplements, essential oils and more at wholesale prices everyday. Carefully crafted handmade toys can become family heirlooms passed from generation to generation. If you have a workshop and some scraps of wood and a few dowels, you can make the wooden toys, and the puzzles and games in these articles. Wooden toys last forever and if you make the toy, the child in your life is sure to love it. Some of these handmade toys are as simple as a scrap of fabric attached to a thread spool to make a parachute. There is a toy on this list for every aged child and every level of toy builder. Read the entire article. Clothing swap parties have become popular in recent years as frugal and fashion conscious men and women find that trading clothes is a great way to update a wardrobe for next to nothing. For those of you who are not into attending or organizing these parties, it is possible to trade your gently used clothes from the comfort of your home. Here are five websites that help you achieve this. Swapstyle is a fairly old clothing swap site that has a large number of listings. It is open to those in the United States, Australia, and Europe. You have to post a picture of the item you want to swap and can also set a sale price for the item in case someone wants to just buy it. There is a fee to become address verified and there is a fairly rudimentary ... Read the entire article. Q. If I pay with cash more often, will I spend less? A. People typically spend less money when they pay with cash rather than a credit card, gift certificate or scrip such as Disney Dollars at a theme park. Researchers report in the Journal of Experimental Psychology: Applied that when you pay in cash and “can feel the outflow of money,” you have a greater aversion to spending. The type of cash you carry also affects the “pain of paying.” In a separate study, University of Maryland researchers found that consumers were more hesitant to break a large-denomination bill than to spend several smaller ones. In other words, you’re more likely to want to hang on to a $20 bill than four $5 notes. Sid Kirchheimer writes about money and consumer issues. As I was assembling statistics to show the wastefulness of the American obsession with turf, I wondered what the productivity of just a small part of American lawns would be if they were planted with edibles instead of grass. I wanted to pull together some figures to share with everyone, but calls to seed companies and online searches didn’t turn up any data for home harvest amounts — only figures for commercial agriculture. From experience, I knew those commercial numbers were much too low compared with what home gardeners can get. For example, home gardeners don’t toss out misshapen cucumbers and sunburned tomatoes. They pick greens by the leaf rather than the head, and harvests aren’t limited to two or three times a season. For years, I’ve known that my California garden produces a lot. By late summer, my kitchen table overflows with tomatoes, peppers and squash; in spring and fall, it’s broccoli, lettuces and beets. But I’d never thought to quantify it. So I decided to grow a trial garden and tally up the harvests to get a rough idea of what some popular vegetables can produce. Read the entire article. Read about the other freebies. Does this article's headline sound like heresy? Does it smack of the worst financial advice of all time? That's exactly what credit card companies hope you think. Consumers have been conditioned to pay attention to one thing when they open their credit card bills: the minimum payment due. But that minimum payment is just a smokescreen to distract you from the numbers that really matter -- how much you owe overall, and the interest rate the bank is charging you." Pay the minimum the bank requires to keep your account in good standing, and when you retire you'll still be paying off that pizza you ordered during your freshman year. Read the entire article. The idea behind my greenhouse/guesthouse concept is to build a greenhouse that has everything you need to live, and not a centimeter to waste. But you don’t have to use it as a greenhouse. It can be a guesthouse or an energy-efficient small home. The design is flexible, so you can incorporate whatever recycled materials you can find. Even if you buy some of the materials and hire a bit of help, you can build a greenhouse for about $3,800. If you plan to use the building as a greenhouse, use insulated, wood-framed windows that aren’t coated with low-e or solar film, because the coating limits heat gain. Adequate thermal mass and a well-insulated floor and walls are necessary to store enough heat for a couple of days without sun. Thermal mass, such as concrete, brick or stone, helps moderate heat, tempering the thermal swings throughout the day and night. To make a guesthouse, include a loft large enough for a double bed upstairs — the warmest part of the building — for cozy winter nights. Read the entire article. FreeRice is a non-profit website run by the United Nations World Food Program. Our partner is the Berkman Center for Internet & Society at Harvard University. • Provide education to everyone for free. • Help end world hunger by providing rice to hungry people for free. As you play a word game, and increase your vocabulary, you are giving grains of rice for each correct answer. This is made possible by the generosity of the sponsors who advertise on the site. You can even set it to keep track of all of the rice you give by choosing definitions for the words given. How wonderful to learn and provide rice for hungry human beings, enabling them to function and be productive. Somewhere in the world, a person will be eating rice that you helped provide. Visit FreeRice.com. For folks who have a balance on their credit card, there are few deals more tantalizing than 0% interest on balance transfers. Why? Because for a period of time, typically six to 12 months, the credit card company is lending you its money for free. That can mean big savings on interest charges for those with revolving balances. It's not unusual for American households with credit card debt to carry balances of $10,000 or more. Typical U.S. families pay more than $1,000 in interest charges on credit cards each year. And rates on most credit cards are locked firmly in the double digits -- quite a bit higher than 0%. Those stats explain why these balance transfer offers are seductive enough to make many consumers skip over the fine print before signing on the dotted line. If you're considering such an offer, you'll want to take a hard look at whether it's such a good deal after all. Read the entire article. Pole-barn buildings are simple to build and have the added benefit of design flexibility. They’re the fastest, most cost-effective way to build permanent, solid shelter to store equipment, house livestock, or function as a garage or workshop facility. You can even use the pole barn approach to build a year-round home. A big part of the attraction is simplicity. There are only four steps involved in pole-barn building, and the first one’s even optional! None of the work requires fancy tools or finely honed skills. The steps to pole-building success are simple: Create a level base pad (if you want more than just the earth underfoot), set poles vertically into holes in the ground, connect them across the top with beams and braces, then put roof trusses on top. No need for a complicated foundation, either. Even in regions with cold, frost-prone winters, pole barns endure well with nothing more than the simplest connections to the earth. And if this weren’t advantage enough, pole barns also offer the option of using your own logs and rough-cut lumber for many parts of the job. The only thing wrong with pole barns is the name. This building approach is so much more useful than for building barns alone. If you’ve never constructed anything large before, then a pole building is a good place to start. The illustration and information you’ll find in this article will equip you to custom build your own durable pole barn based on universal design and building principles. Read the entire article. How about an earth-friendly way of shipping your packages and saving money at the same time? CitizenShipper offers a unique shipping service that connects you with citizen couriers providing you with cheaper, faster and safer shipping than all the traditional courier and delivery services. Our database contains thousands of delivery drivers, couriers and movers all waiting to bid on your job! The drivers work 24 hours a day, 7 days a week so no matter when or where you have a job, we can help! What's so original about our service is that we match drivers who are already planning on driving somewhere anyway! Because of this, drivers are usually willing to make your deliveries for a fraction of the cost of more traditional services. As an example, Brady R. from Denton, TX recently requested some wood flooring be shipped from Houston to the Dallas area and had offers at $30. And another recent shipment was for Donna S. Donna had two twin beds delivered in Houston Texas, for $15. Read the FAQ's. I handed him my debt card and the cashier asked if I wanted to charge it credit or debit. Is he insane? A few years ago when I first got my debit card, I was confused whenever a cashier asked me whether I wanted to charge my card using credit or debit. Debit please, I always said, wondering whether those people recognized that it’s actually a bank card. Eventually, I found out that my debit card was capable of ... Read the entire article. Changes in the economy have pushed more and more people into part-time, temporary, and freelance work, as more and more companies cut back on traditional, long-term, full-time employees. Recently the Newshour on PBS had a report by Paul Solman on the problems faced by freelancers in a tough economy — and pointers to some useful resources. The key resource that Paul pointed to in the segment was the Freelancers Union, an organization that exists to help freelancers buy for themselves the sort of benefits that an employer might offer, such as group health, dental, disability, and life insurance, and a 401(k) plan. I haven't looked over their plans and don't know if they're good deals, but they're certainly worth"
World Wide Opportunities on Organic Farms (WWOOF) is a world wide network - It started in the UK in 1971 and has since become an international movement that is helping people share more sustainable ways of living. WWOOF organizations link people who want to volunteer on organic farms or smallholdings with people who are looking for volunteer help. WWOOF organizations publish lists of organic farms, smallholdings and gardeners that welcome volunteer help at certain times. The diversity of hosts available offers a large variety of tasks and experiences. Volunteer helpers ("WWOOFers") choose the hosts that most interest them and make direct contact to arrange a stay. Volunteers usually live as part of the family. For the USA, visit WWOOF USA. To find other countries, visit WWOOF Around The World. Get more free vacation ideas at Couch Surfing.org. Are Extended Warranties Ever a Good Deal? Extended warranties are everywhere. Every time you buy a car, a house, a computer, a cell phone or pretty much any appliance, you'll be offered a chance to purchase an extended warranty on it. A few years ago, my husband came home with a new toaster — and a warranty contract for it. Are these warranty contracts ever a good deal? They shouldn't be. To make a profit, the private companies that offer these things need to take in more money than they pay out in warranty claims. And they do make money. The profit margin on extended warranties is reputed to be between ... Read the entire article. As a savvy investor, you should be worried about the decline of the dollar, because this directly hurts the value of your paycheck. However, like everything else in life, economic trends have two sides to them. In our case, dollar depreciation can actually be your opportunity to invest in other currencies. Even if you’re not particularly concerned about the recent decline, investing in foreign currency will"
When couples make a decision to have a baby, they rarely realize just how expensive this kind of stuff will be. As the pregnancy progresses, they start stocking up on some items and the sticker shock is palpable. Luckily, there are ways to get everything you need and not spend a fortune. Thank goodness for the environmental movement, since it has lead to wonderful resources like Freecycle.org. This is a website where you can acquire just about anything for free, as long as you are willing to go get it. You can get whole bagfuls ... Read the entire article. We've all likely burned a pot of something in our lifetime, but sometimes a ruined dinner may not be so ruined after all. Learn a few tricks of the trade and save yourself some time and money. As more and more families go back to basics and choose to stay home to eat, there is a big interest in the recipe industry and cooking shows. Catching a few episodes of these shows or investing in a new cookbook can certainly help to keep meals at home fresh and interesting. If you make a mistake during your experimentation, don't throw out the food. Use these 5 quick fixes to salvage a good meal. Our companion animals give us love all year long, and the holidays are a wonderful time for us to give back. 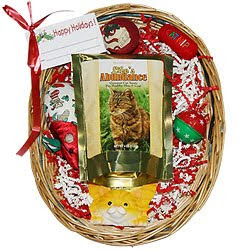 Holiday Baskets are the perfect gifts for your pets and your pet friends. 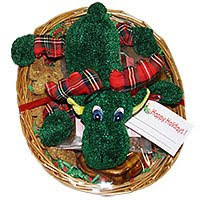 This festive basket contains an entertaining plush toy and an assortment of our most popular treats, including: Wholesome Hearts (low-fat, heart-shaped sensations), Gourmet Dental Treats (honey peanut butter recipe), Antioxidant Health Bars (oatmeal and apple recipe), a bag of Tasty Rewards (savory chicken and venison jerky) and a Porky Puff (hickory-smoked chew) to top it all off. Limited quantity ... they go fast, so order now! This lovely basket contains a delightful assortment of playful toys that will keep any furry feline happily occupied during the holidays. For the proud cat parent, we included an adorable hand-painted cat photo frame so you can proudly display your cat's photo all year long. And last but not least, we’ve included a bag of Life’s Abundance Gourmet Cat Treats for Healthy Skin & Coat. I am an expert time waster. It’s actually a gift. You give me a block of time, even an entire day, and I can accomplish next to nothing through all of it. Don’t get me wrong, I’ll look busy. I’ll sit at the computer and keep typing. I’ll keep moving about the house as if there are several projects I’m working on at once. But it’s all an act. A show, if you will. Perhaps I should take it on the road. Charge admission. Put on several shows a week. Nah, that sounds like too much work. You’re probably reading this wondering, where exactly does this gift come from because I think I’ve got it, too? In fact, you may think you are even more an expert at this gift than me. I’d challenge you to a time-wasting duel, but that would be a colossal"
Over the last couple weeks we have been intentionally consolidating our financial accounts. The credit card I signed up for back in college to get a free t-shirt, gone. The bank account I opened to get a great deal on financing from a local car dealer, gone. It is actually empowering to eliminate the noise from your financial life. Less statements, less chance of identity theft, less balances and account numbers to keep up with. However, there are good reasons to keep at least one bank account, and one credit card, that you don’t use often for physical transactions. Read the entire article. David’s Note: There’s a recession and people are still afraid of losing their job, yet my friend recently found the courage to resign and couldn’t be happier. Freelance or owning your business is definitely not for everyone. The uncertainly and instability of income presents a different kind of stress, but it could also change your life for the better if you are willing to put in hard work. We all fear the unknown, but access YOUR situation and if the writing is on the wall to leave the nine to five, please read it and do something. Read an unedited version of what my friend had to say about his decision to venture into the unknown. To many, working the banker’s hours of nine to five is a dream come true. Waking up late enough in the morning not to be grumpy and getting home from work with plenty of time to spend with the loved ones (Including your T.V.) is certainly a pretty picture for most. Until recently, I was stuck at a job I was good at but hated"
I know that many of you have lost special people this year and holidays are an emotional time that tends to make it harder without the loved ones that have gone on before us. My mom died on Christmas Eve and somebody gave me this. It's been a treasure to me every year. I hope it brings some peace to your heart. Who found Christ, the truth and the way. We bring to our Savior and King. That all may be saved through His Name! Oh, loved one, I wish you could be here! I witness in Heaven so fair! We were so happy in every way. To share all the glories I see! Beyond all our partings and tears!. Everyone should be asking themselves at one point or another – “Should I Pay Off My Mortgages Early”? When choosing whether to pay down debt or invest, the primary factors are the interest rate on the debt and what rate of return you think you could safely achieve by investing. Sometimes, however, this calculation isn’t as straightforward as it appears. For example, even your after tax interest rate on a fixed-rate mortgage can change over time. Let me explain. If your mortgage interest is your only itemized deduction (or if your other itemized deductions are not sufficient such that they’d be larger than the standard deduction), then only a portion of the mortgage interest deduction is really providing you with a tax benefit. Therefore, as the amount of interest you’re paying goes down–because your outstanding mortgage balance is decreasing–your after-tax interest rate increases. How about an example ... Read the entire article. As the unemployment rate climbs and it takes longer to find a job, more people are being forced to consider relocation to a new town for better job opportunities. In fact, if you’ve been job-hunting for a while, you’ve likely expanded your search to cities far enough away that you’d have to make a move. However, this long-distance job search can only go so far – travel expenses for interviews can add up, and you miss out on crucial face-to-face networking opportunities. I use cheap ... Read the entire article.